Writers spend a large amount of time thinking about them and looking for them. It’s an undeniable part of the creative process. So why would I consider them such a pervasive threat to good writing? Good ideas are just part of what it takes to produce the kind of writing that provokes interest from an audience. And quite often they lack substance. A good idea might be confusing when it’s translated into words. Or it might not be useful for other people. Or it’s not actually an accurate representation of your beliefs. Let’s look at three scenarios where good ideas can stifle your best work. It’s too entangled in expectations for my taste. And it can cause an otherwise smart writer to rush ahead with an idea … without polishing it properly. Getting caught up in excitement can make you blind to the hiccups that make it difficult for someone else to understand and appreciate your work. 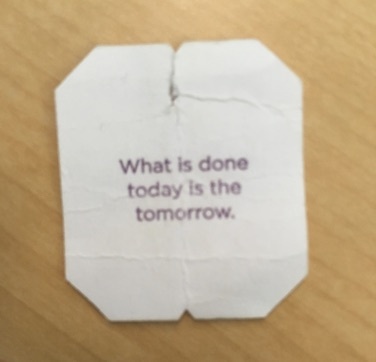 For example, take a look at the text on this tea bag tag. The writer probably had good intentions, but the note doesn’t make much sense. When I get “writer’s block,” good ideas are commonly the cause. Things start to go south when I think an idea will be easy to write about because I like it so much. Subsequently, I might not schedule enough writing time. Then, when I do sit down to write, I feel a lot of pressure. The good idea becomes like a strict and demanding sports coach who is continually disappointed, despite my practice and effort. If I don’t immediately think the words I draft are good enough for the good idea, I feel stuck. But I’m holding myself to way too high of a standard. I don’t need to give the idea that much power over my behavior; I just need to start writing something. A vague idea can sound very appealing in your mind. This type of “good idea” is far from a practical plan you can execute. In other words, the idea makes you feel brilliant, but you don’t specifically know what you want to do or how to do it. This is the opposite of Scenario #1. Instead of rushing ahead and creating a mediocre piece of content, you turn into an “all talk, no action” type of writer. Get in the habit of producing an abundance of ideas — good and bad ones. Value all of your ideas. Dissect them, rearrange them … hell, even obsess over them if you need to. For each idea you have, your first and most important task is to make it clear. 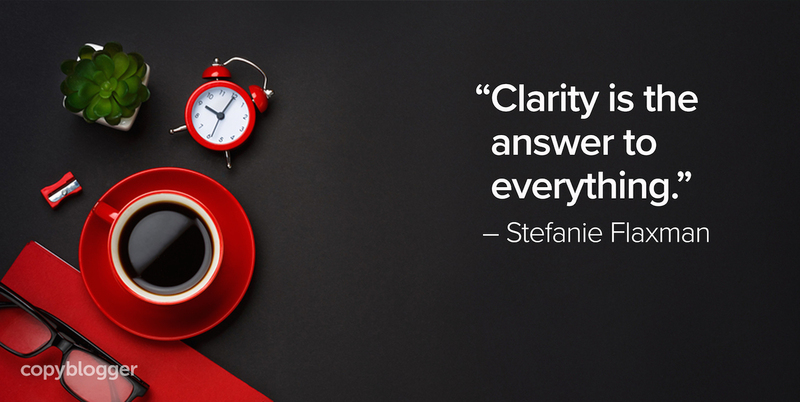 Clarity is the answer to everything. It helps you overcome each of the three scenarios above. Your excitement will be grounded in a refined message. Your writer’s block will seem shallow. Your pompous talk will transform into deliberate action. If you can make your point clear and then combine it with style, you won’t have to worry about it appearing bland. A clear idea is not diluted or dumbed-down. An idea must be clear before it’s thought-provoking and nuanced. Yup. “Write with the door closed, rewrite with the door open. Your stuff starts out being just for you, in other words, but then it goes out.” Just like that tea bag. It definitely could be a non-native English issue. I’m curious about other possibilities, since my version was just a guess. So true! Good ideas, bad ideas, they come to creative souls in an endless flow. You’re giving sound advice in this piece. Learning how to deal effectively here can open the flow and keep the confusion and dead ends at bay. Thanks for sharing! Holy cow, this is helpful. I have this one Really Big Idea in my head and I haven’t published anything in it because I can’t find the perfect metaphor to get the idea across. Yet I’ve written several pieces for clients since I had the Really Big Idea. Most of my best writing has come from, creating a great title, and then just writing from the heart. I’ll let my passion and emotions dictate what I write. My strong feelings and beliefs will jump out from my screen, in the form of words. I let my creative mind do the talking, and I step out of the way, so that it can shine bright. I love the comment that a good idea can make you pompous. I guess we all need to have some humility. I always find that it helps to build a structure for an article regardless of whether the idea is “good” or “average” (I am assuming that a bad idea would be rejected). If you follow a structure then it is less likely that you will fall into some of the traps that you have outlined. Have faced these a lot in my writing, especially the 1st scenario. Thanks Stefanie for this. It was quite helpful. The first one is so tricky because it’s great to be excited and take action, but we have to give ourselves time to both explore and then fine-tune our ideas as well to make them the best they can be. It’s always a balance. Indeed, Clarifying your ideas is really the answer in building great content. Making it easy to understand that could produce sharp, clear, intelligent content, which become much easier for people to see the value in it. Bad or good ideas are really part of the process though. Thanks for these great ideas, keep posting. Yep, Judy! It’s really about making the value of your content clear. Holy cow, Charles Bukowski must be in the air. I wrote a blog post on his believe that a writer writes to please himself and nobody else.